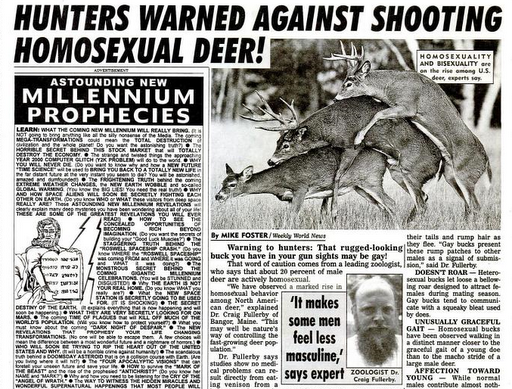 I’ve been an avid fan of the Weekly World News since I was just a young buck who still believed that there was no such thing as redneck aliens. It was a sad day for me when “the world’s only reliable newspaper” released it’s last issue. But I am very pleased to report that back issues of the Weekly World News are available on Google Books. And by back issues, I mean they go all the way back to 1985. Got plans this weekend? You do now. One of my favorite stories. When I asked my high school morality teacher, who was a Catholic priest, if the church considered this wrong, he said, “No because deers don’t know any better.” And that is one of my favorite high school memories, boys and girls. I’ll never forget when I read Neil Gaiman’s Fragile Things and he admitted to “having much fun making up stories” for his friend at the WWN to use. I thought, “Aha! I knew it!” But really, I didn’t need proof. I always liked the way the Weekly World News never let on that their articles were full of it. To me, they were the poor man’s Onion and were sometimes, if not often, just as good. The full archive of Weekly World News papers starts at 2007 goes back from there. They also have a website (where they are slightly more forthcoming about their truthiness), a Facebook page, a store which sells books and t-shirts, and, I kid you not, Bat Boy: The Musical. Coming soon to a theater near you.